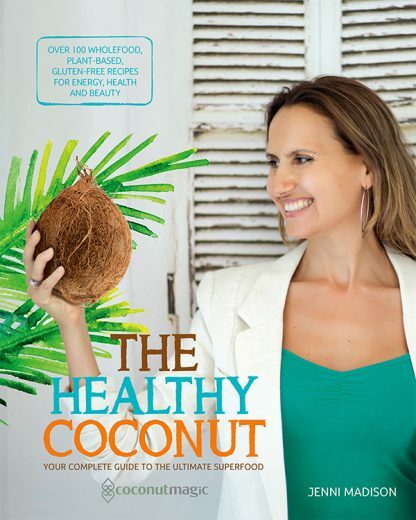 The Healthy Coconut is a simple guide to incorporating the amazing benefits of coconut into your daily lifestyle. The Healthy Coconut features more than 100 whole food, plant-based and gluten-free recipes, bursting with coconut goodness and superfood nutrition. This book will show you how to use coconut, both internally and externally, to receive maximum health and beauty benefits, and toxin free-living. Just one scoop of virgin coconut oil delivers a wide-range of healing properties. Produced in it's most natural state, coconut oil will benefit you, your children and your pets. Whether you have chronic fatigue, weight problems, digestive or skin issues, or just want to give your body a good cleanse and boost your energy, this book is your one-stop coconut bible! More than 100 whole food, plant-based and gluten-free recipes, bursting with coconut goodness and superfood nutrition. Jenni Madison is the founder and managing director of fair-trade company Coconut Magic. She adopted The Healthy Coconut lifestyle after personally discovering the amazing health benefits of coconut oil while living and working in Thailand in 2010. She is a regular media contributor and a speaker at health and wellness events across the country. She has amassed a significant social media following of more than 120,000 engaged fans.